My creation for the Virtual Pet Jam, Sphere Pet is a simple game where you feed a sphere various other spheres (cannibalism! Or is it canni-ball-ism?) and make it perform menial exercises for your amusement. Feeding! 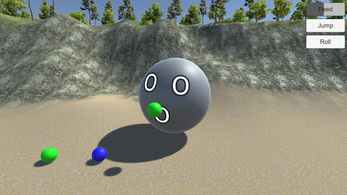 Feed your sphere other spheres and watch it change colour like some sort of round flamingo! Petting! 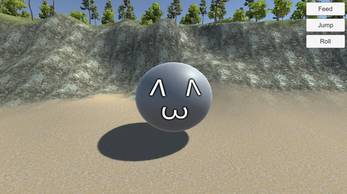 Poke and rub your sphere to manipulate its tiny feelings! Jumping! Jump into the sky! Channel the power of red to jump even higher! Sphere Pet was made in Unity 2017.3. I worked on it alone, with only the many iterations of spherical pets to keep me company. Extract the files and run the file named "SpherePet_win64.exe". If you hold alt while doing so, you can change the resolution to something else, though I can't guarantee it will look pretty or sensible at extremely wide aspect ratios.